16 MMS March 2017 mmsonline.com MARK: MY WORD Commentary A New Era of Ethics Companies that do what is right will do well. And everyone is watching. Recent political and social events have brought the issue of ethics to the fore. Ethics defines right or proper behavior, and it is somewhat determined by the par ticular field to which it applies. For example, what is considered proper behavior for journalists differs from that for, let's say, elected public officials. Of course, manufacturing com- panies are also subject to ethical principles. We are entering an era in which ethics is becom- ing a more prominent concern and matter of scrutiny—and object of judgment. Businesses will be affected by this change. Companies that demonstrate high compliance with ethical prin- ciples will be rewarded because customers, business par tners, investors and prospective employees will give greater preference to them. Social media and online commerce will make judgments about a company's ethics immediate and intense. In the court of public opinion, for which there is no due process, rewards and punishments will be meted out vigorously, but not necessarily fairly—especially on the web. One of the big problems to emerge is that there are no universal ethical standards, but only prin- ciples. Ultimately, the principles of ethics fall back on moral codes (morality being an individual's personal sense of adhering to what is right or wrong). Here's the rub: Morality is usually based on religious, cultural or traditional norms, and MARK ALBERT EDITORIAL DIRECTOR MALBERT@MMSONLINE.COM "Enthusiasm for ethics must be grounded in clear, disciplined thinking." these vary widely. We've already seen what can happen when business leaders face a conflict between deeply held religious beliefs and legal mandates. Clearly, there is no guarantee that increased attention to ethics will lead to a sunnier, not stormier, business climate. My thoughts on what companies ought to do: Get ahead of this issue. 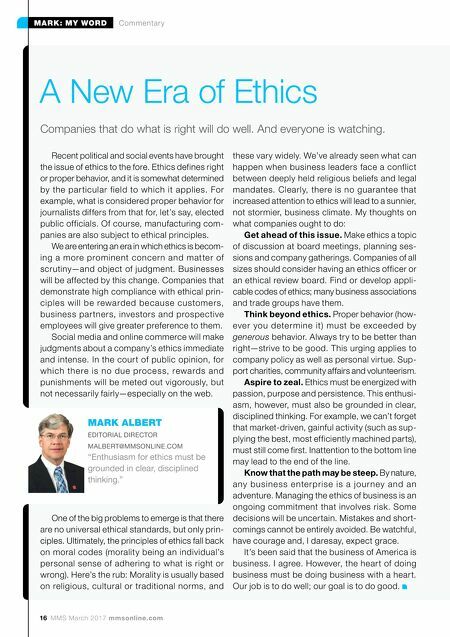 Make ethics a topic of discussion at board meetings, planning ses- sions and company gatherings. Companies of all sizes should consider having an ethics officer or an ethical review board. Find or develop appli- cable codes of ethics; many business associations and trade groups have them. Think beyond ethics. Proper behavior (how- ever you determine it) must be exceeded by generous behavior. Always try to be better than right—strive to be good. This urging applies to company policy as well as personal virtue. Sup- port charities, community affairs and volunteerism. Aspire to zeal. Ethics must be energized with passion, purpose and persistence. This enthusi- asm, however, must also be grounded in clear, disciplined thinking. 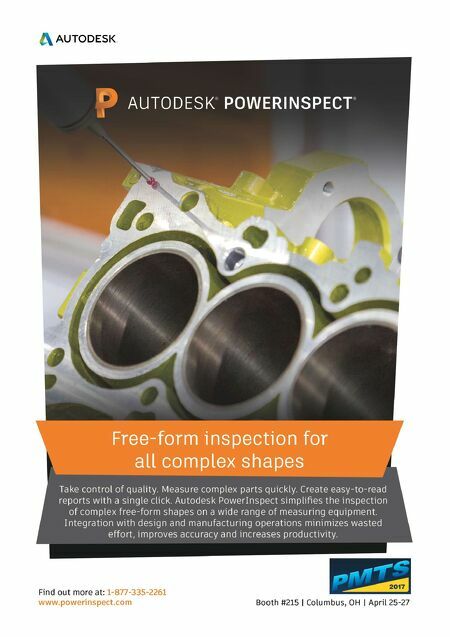 For example, we can't forget that market-driven, gainful activity (such as sup- plying the best, most efficiently machined parts), must still come first. Inattention to the bottom line may lead to the end of the line. Know that the path may be steep. By nature, any busine ss enterprise is a journey and an adventure. Managing the ethics of business is an ongoing commitment that involves risk. Some decisions will be uncertain. Mistakes and short- comings cannot be entirely avoided. Be watchful, have courage and, I daresay, expect grace. It's been said that the business of America is business. I agree. However, the heart of doing business must be doing business with a heart. Our job is to do well; our goal is to do good.